Thanks to Dr. J. J. Sola, Cl�nica Universidad de Navarra, Pamplona (Spain), for contributing this case. To contribute a Case of the Week, follow the guidelines on our Case of the Week page. This 23.75-hour review and update in the areas of clinical immunology, microbiology, and infectious diseases is intended to improve knowledge about the pathogenesis and clinical manifestations of infectious diseases, immunological mechanisms of disease and disease prevention, appropriate approaches to the diagnosis of infections and immunologic disorders, and utilization of the clinical microbiology and immunology laboratory, including selection and interpretation of results. This course will provide a forum for the exchange of ideas dealing with microbial infections as well as immunity to infectious diseases and immunologic disorders. Faculty consists of clinicians involved in patient care, pathologists, and clinical laboratory scientists. Discussion of timely topics by faculty and participants assures that this course will be informative, interesting, and relevant. (1) We are seeking expert reviewers for these chapters: Breast-nonmalignant, Coagulation (part of chapter), Ovary-nontumor (about 12 topics left to review) or Salivary glands (part of chapter). You can review 3-4 topics, the balance of the chapter or something in between. If interested, send your CV and indicate what you want to review to eapathology@gmail.com. 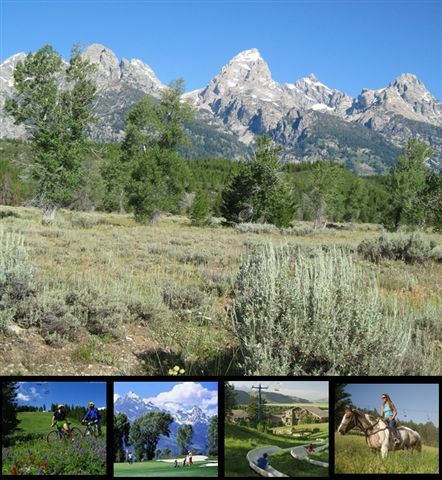 More information is available by clicking here. 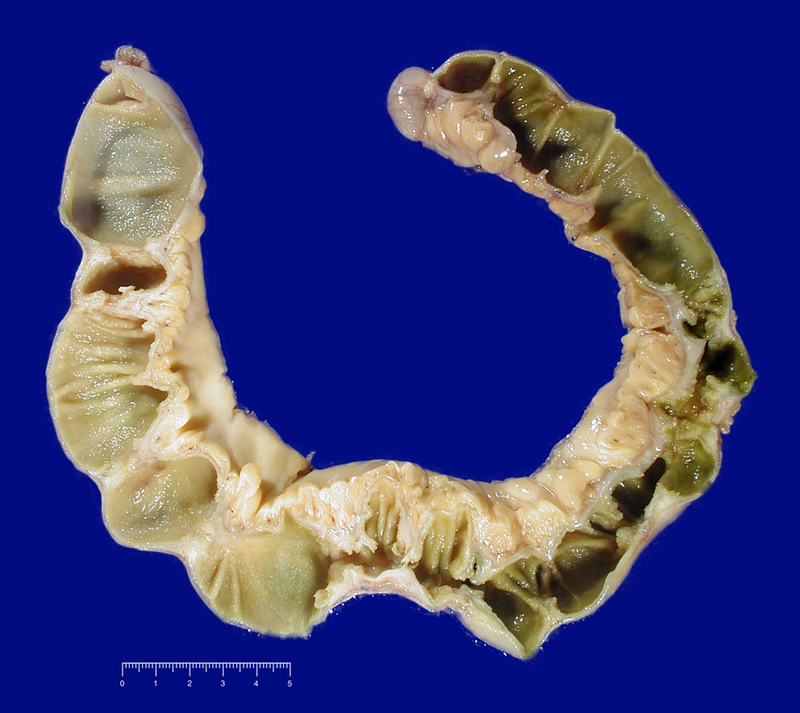 A 46 year old woman had a chronic history of abdominal discomfort. 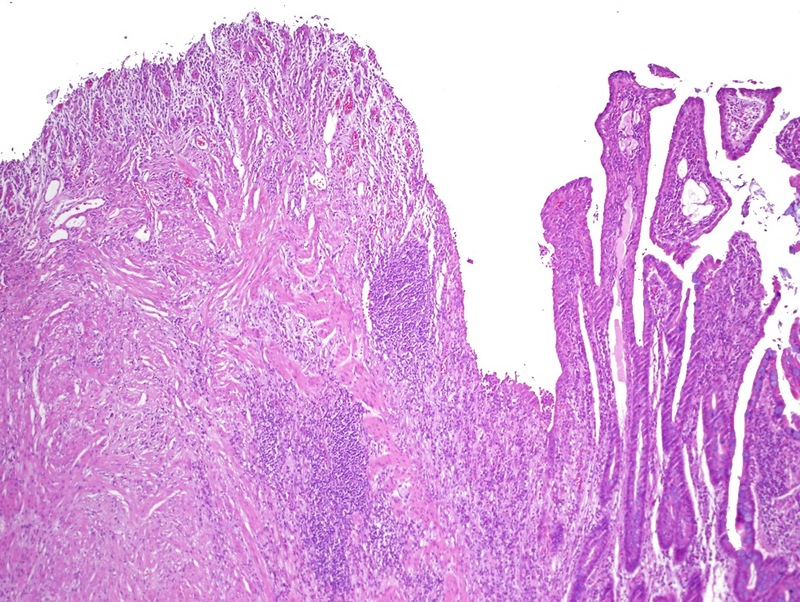 Five years ago, an ileal biopsy showed non-specific chronic erosive inflammation, and Crohn disease was clinically diagnosed. 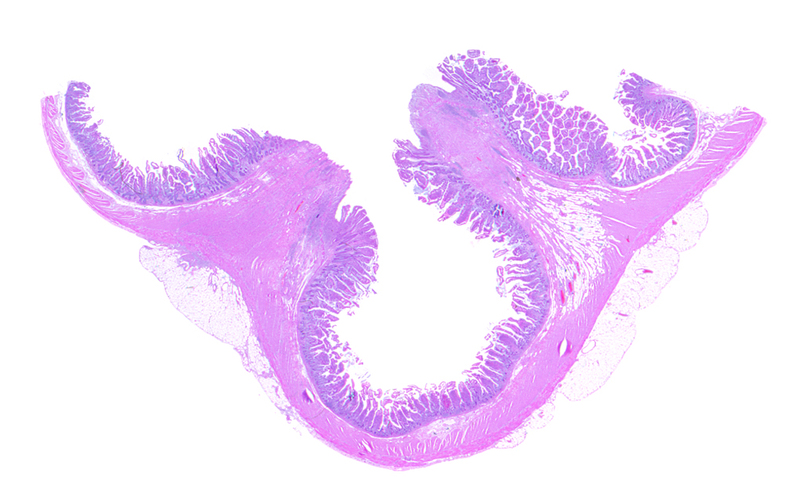 After a CT scan showed "tumoral enlargement of the ileal wall", her terminal ileum was resected. 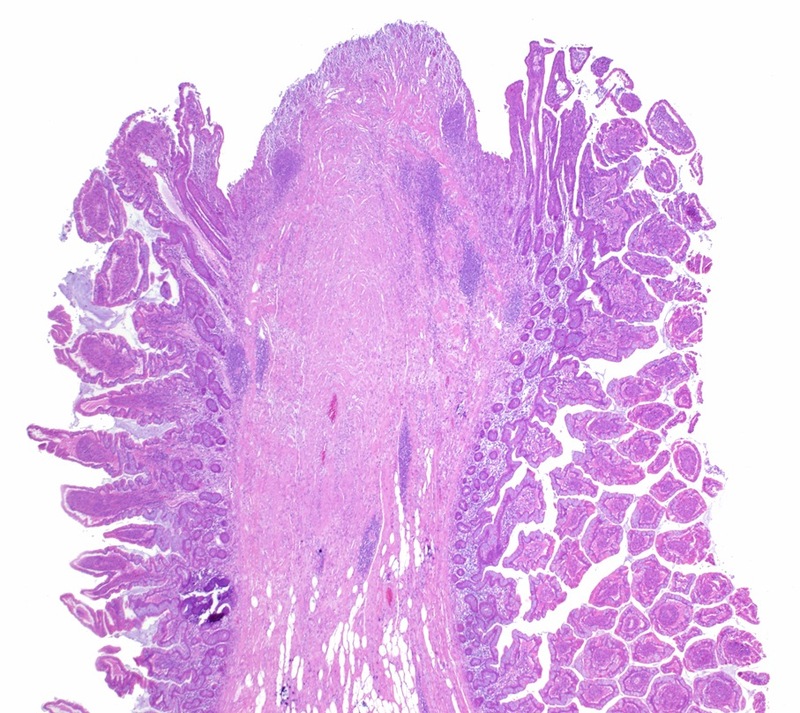 Diaphragm disease was first described in 1988, based on a review of small bowel resections to assess whether they exhibited any pathology related to non steroidal anti-inflammatory drugs/NSAIDs (J Clin Pathol 1988;41:516). 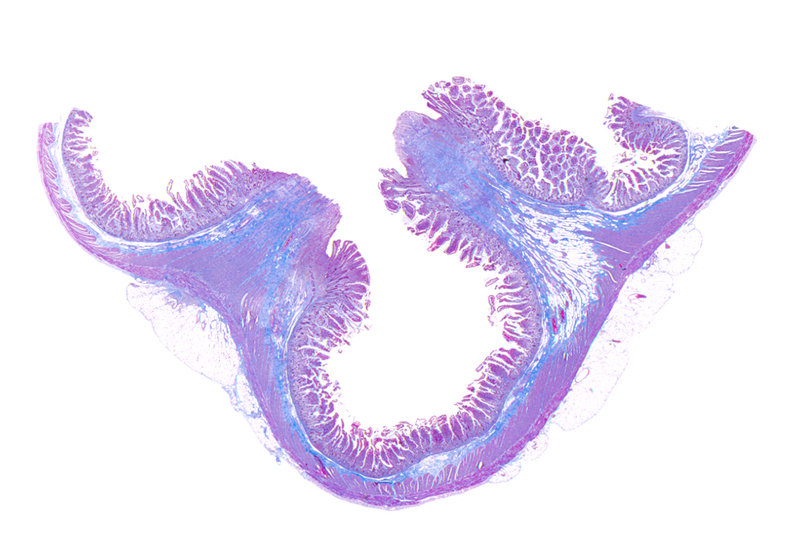 A characteristic finding was the segmentation of the ileum by the formation of incomplete mucosal diaphragms, defined as thin circumferential membranes resembling the plica circularis, and composed of mucosa and submucosa with accompanying fibrosis. 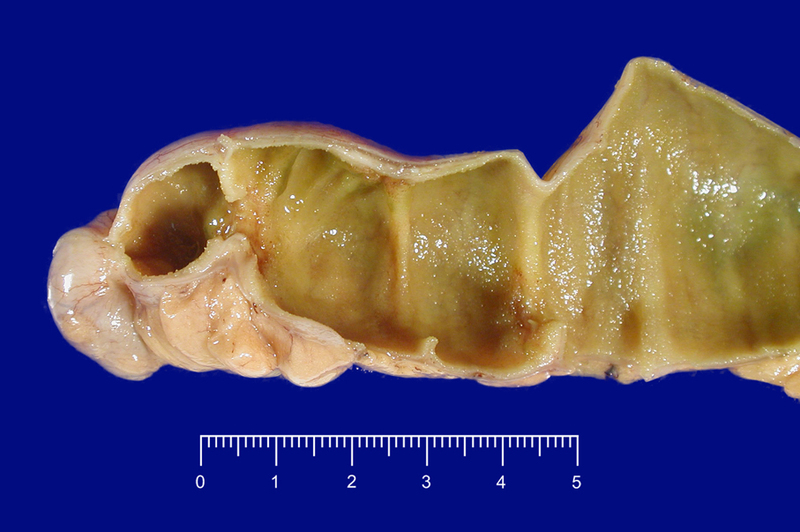 Other common gross features included ulceration, strictures and perforation. 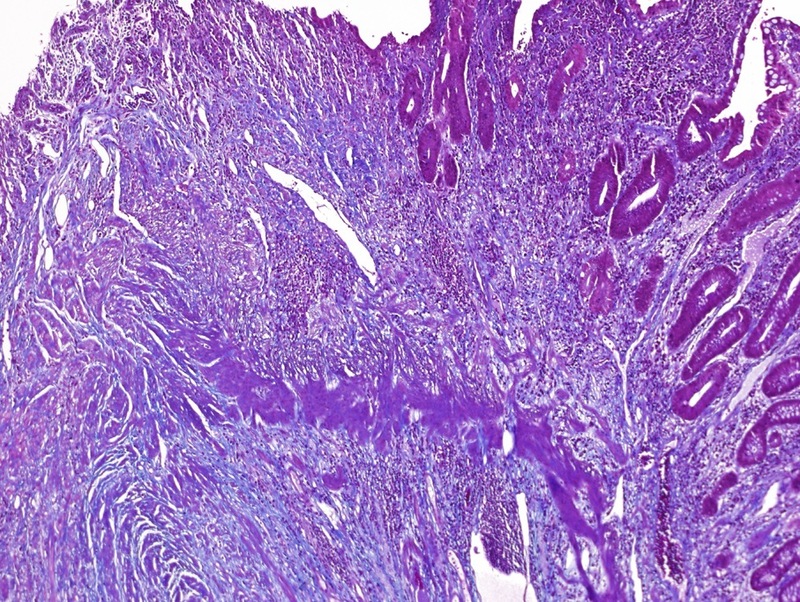 Histologically, these specimens also show neuromuscular and vascular hamartoma-like changes, eosinophilic enteritis and acute inflammation (Am J Clin Pathol 2008;130:518). 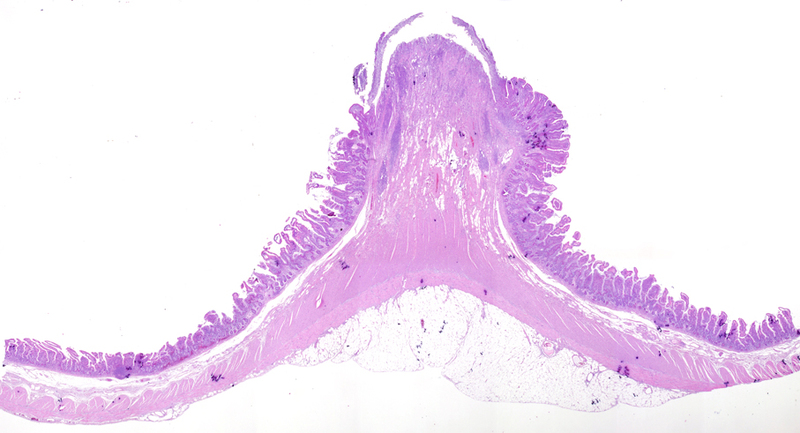 The differential diagnosis includes cryptogenic multifocal ulcerous stenosing enteritis (CMUSE), defined as small intestinal strictures and ulcerations of unknown origin (World J Gastroenterol 2011;17:2873). 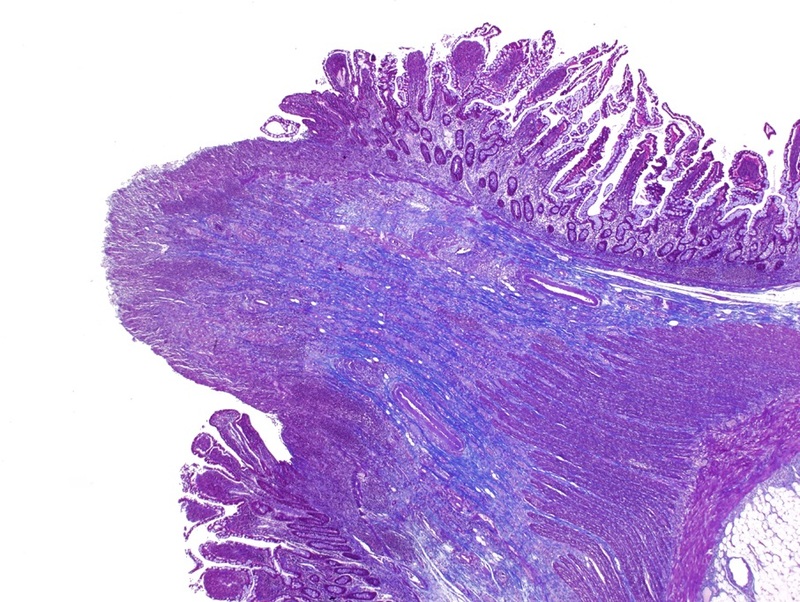 It is characterized as an atypical vasculitis presenting with unexplained stricture and ulceration of the small bowel in young and middle-aged patients, but without systemic inflammation. Of note, CMUSE can be treated with steroids. Patients with diaphragm disease are often treated with surgery (Colorectal Dis 2011 Aug 3 [Epub ahead of print]) or endoscopic balloon dilation (Gastrointest Endosc 2006;64:1014). Cessation of NSAID use is recommended. In this case, after the pathological diagnosis, a history of chronic low-dose aspirin was discovered.